Network security consists of the provisions and policies adopted by a network administrator to prevent and monitor unauthorized access, misuse, modification, or denial of a computer network and network-accessible resources. It involves the authorization of access to data in a network, which is controlled by the network administrator. Usually, network security covers a variety of computer networks, both public and private, that are used in everyday jobs conducting transactions and communications among businesses, government agencies, and individuals. This chapter explores network security. Security is a critical concern around the world that arises in protecting our ports, airports, transportation or other critical national infrastructure from adversaries. Nowadays, security arises in problems ranging from physical to cyber physical systems. In particular, network security becomes a challenging topic, and the research community has been paying attention to the network security problem. However, the problems are far from being completely solved. For more than one decade, game theoretic approach has been recognized as a useful tool to handle network attacks (Liang, & Xiao, 2013), (Tambe, Jain, Pita, & Jiang, 2012), (Roy, Ellis, Shiva, Dasgupta, Shandilya, & Wu, 2010). In this chapter, we review the existing game-theory based solutions for network security problems (Figure 1). Most game theoretic approaches applied in network security require attack-defense; the interactions between attackers and defenders may be formulated as non-cooperative behaviors which may then be described and solved using game theory (Liang, 2013). 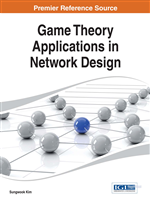 Therefore, the most existing game-theoretic research as applied to network security falls under non-cooperative games. Non-cooperative game models including two subclasses, static games and dynamic games. Moreover, within static and dynamic subclasses, game model can be further grouped in terms of whether they are of complete information or whether they are of perfect information (Liang, 2013). All static games are one-shot games of imperfect information. Therefore, static games with perfect information do not exist (Liang, 2013). According to the completeness of information, static games can be classified into two sub-classes - complete information static games and incomplete information static games. Complete information static games model the scenario of the interactions between attackers and defenders. The solution to complete information static games is the Nash equilibrium. When defenders could not always distinguish attackers from regular users, not only the interactions between attackers and defenders but also those between regular nodes and defenders should be considered. Therefore, the games are modeled as incomplete information static games, which could model the interactions not only between attackers and defenders, but also between regular nodes and defenders. In this game model, defenders keep an inference of the type (malicious or regular) of another node as its opponent. The solution to incomplete information static games is the Bayesian Nash equilibrium (Liang, 2013).